Security forces waged an escalating crackdown on protesters demanding the ouster of leader Moammar Gadhafi in several eastern Libyan cities. In the country's second largest city, Benghazi, 35 bodies were brought to one hospital Friday. These were protesters shot while trying to march on one of Gadhafi's residences, a doctor from Benghazi's al-Jalaa hospital said. Protesters tried to rally outside the Katiba, a military compound where Ghadafi stays when he visits Benghazi. Security forces inside the compound opened fire on the protesters. Dead & wounded began flowing into the hospital's emergency ward in the afternoon, in groups of five or six, many with bullet wounds to the head or chest. The doctor, who chose to remain anonymous, fearing reprisal, said he counted the bodies in an ICU unit used as a temporary morgue. Several dozen had already reportedly been killed in the unprecedented wave of protests that had erupted the previous four days as the pro-democracy movement that has swept up the Middle East reached one of the region's most closed nations. 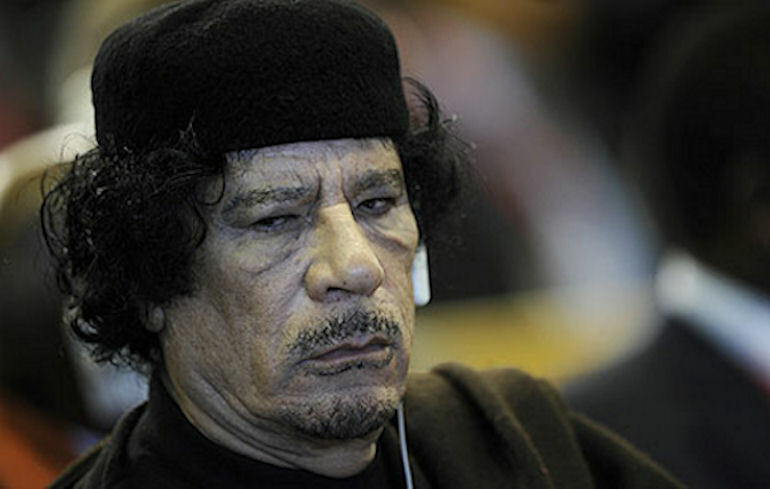 Gadhafi has ruled virtually unquestioned since 1969. Forces from the military's elite Khamis Brigade moved into Benghazi. The Khamis Brigade is led by Gadhafi's youngest son Khamis Gadhafi, & has been called "the most well-trained & well-equipped force in the Libyan military". "This alarming rise in the death toll, & the reported nature of the victims' injuries, strongly suggests that security forces are permitted use of lethal force against unarmed protesters calling for political change," Malcolm Smart, Amnesty International's director for the Middle East & North Africa, said of the Benghazi bloodshed. Libya is oil-rich, but the gap between its haves & have-nots is wide. The protests have flared hardest in the more impoverished eastern parts of the country, the site of anti-government agitation in the past. It is estimated that about one-third of Libyans live in poverty. Also the Libyan people are tired of the more than forty-two year reign of Gadhafi. Abdel Hamid Ali Ahmed El Shari (Arabic:حميد الشاعري), known as Hamid El Sha'eri, is a Libyan musickian & singer currently residing in Egypt. He is considered the real father of modern Arabic music. He is the founder of the Al-jil or Jeel Musick. 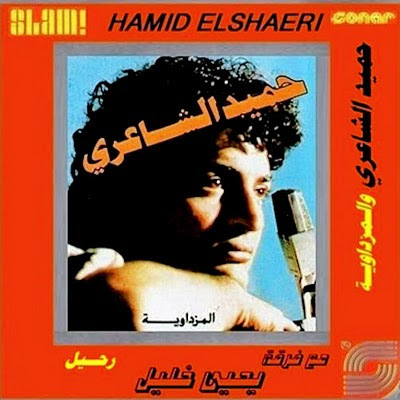 Hamid El Sha'eri was born October 29, 1961 in the Libyan city of Benghazi, studied aviation in England, studied musick in Cairo, then settled permanently in Egypt in 1974, after witnessing Colonel Gadaffi's public burning of western musical instruments. A refugee from his own country’s hostile anti-modern policies, he steadily made a name for himself as Egypt’s leading champion of westernized synthesizer pop, known as Al-jil (generation musick). This style of musick is a deft blending of disparate sounds. Al-jil has all the dance appeal an array of samplers & synths can serve up, tempered by a distinctively Middle Eastern melodic sound. Although the establishment turns its nose up at Al-jil, it clearly has a wide enduring appeal. I'm sincerely worried about what is taking place in Libya right now. Of all the countries in which protests are taking place, it appears that Libya has the greatest possiblity of seeing a true massacre take place. I hope that the opposition is powerful enough to oppose the insanity that Gidaffi is threatening to unleash on the country. I have seen a few promising reports indicating that many of the soldiers are defecting and defying direct orders from Gidaffi. However, I have also seen some very unsettling reports, such as aircraft strafing civilian protesters. btw I just wanted to say that you are doing a great job NO. I've had to turn the computer over to my girlfriend this week so that she can hunt for a job, but hopefully I'll be able to dedicate a few more posts to the protesters then. Strange Ranger has been tied down with school work also. It seems as if our circumstances only allow one of us to contribute at a time, at least for the most part. Perhaps one day in the near future all four of us will be free to contribute on a semi-regular basis. It reached a point where it was hard to keep up with all of the different countries that were protesting there for a while, but I believe that I have a firm grasp of the situation in each of the countries now. Some of the protests have died out a bit, such as the one in Algeria, and it appears that the protests in Iran hit a dead end, while Libya unexpectedly exploded seemingly overnight. I honestly believe that Gidaffi will fall soon, but I do not believe that we will see any leaders abdicate their leadership. Hopefully I will be proven wrong though. @f(illzy): I find your comments rather strange my friend. First of all, I watch Al Jazeera several hours each day. Considering we are getting our news from the same source, I find it odd that our opinions are on the opposite end of the spectrum from one another, and you are saying that I am a "victim of the mass media." How can I be a victim of the mass media when I get my news from the same source as you? Al Jazeera calls Gaddafi a tyrant, and has openly supported UN intervention. You also seem to have missed the fact that Nathan and I have openly criticized United States foreign policy on several occasions. I am not happy with many of the things my country does. I do not nor did I ever support the invasion of Iraq. I am not in favor of our relationship with Israel, a country that has used our weapons to brutally suppressed the Palestinian people for decades. However, I also believe that we do actually have good intentions behind some of our actions. I take a great deal of pride in educating myself on these matters. I also make it a point to retrieve my information from a variety of sources, in order to prevent myself from being a victim of the mass media. Not only do I regularly read and watch news from foreign media outlets, but I also correspond with people living in the countries where such events are occurring. I can admit that Gadaffi has done some good things for his country. I find it admirable that he shared the oil wealth with civilians. However, he has also openly threatened civilians with violence. It is unacceptable to threaten to go from home to home with the intention of "cleansing" those who do not support your regime. You hold a minority opinion on this matter. Even the Arab League supported a no-fly zone in Libya. Not a single member of the Permanent Security Council vetoed the UN resolution. China, Germany and Russia all abstained from voting when they could have very easily vetoed the resolution, since their status as a permanent member of the security council allows them to do so. I would also like to know what your source is for the claim that the protests in Egypt, Libya, etc. were organized by American mercenaries. I have talked to many different people from Egypt and Tunisia in particular. Those revolutions occurred because the people were sick of living in a police state, and were finally able to overcome their fear. I'm serious when I say I would like to see your source for this information though. I'm open minded enough to read whatever it is you are reading. In the meantime though, I have to completely disagree with you, until you can either refute the arguments I have presented above, or provide me with a [b]reliable source[/b] of information that proves otherwise. I hope that we can discuss this in an intelligent and mature manner. You know that I consider you to be a friend. I just don't see eye to eye with you on these issues. However, I believe that we can learn from one another. I believe our difference in opinion brings up an important question about the influence and importance of regional media outlets and sources, and how they help to shape people's opinions. I hope that you feel the same way. I look forward to hearing back from you and I hope you are doing well. Take care. Man I don't want to offend you, sorry if I did. Ok, I give you some links with sources later. But it is independent sources. Of course you can't find an information about organized revolutions by american merceneries because its blocked from people. But its true. Of course there is a people who don't like goverment in every country, who wants revolution, you just need to start a fire and then it will grow. So fire is always started not by usuall people, but the ones who understands and organized it. And then its just grow on. And I can send you some links where the experts explaining how they did it. There is no tyrany in Libia. Did you know that Libia is only one country that get to record guiness book because of the smallest percent of inflation per year? Did you know that nurse in Libia had 1000$ salary? Did you know that there was a time in Libia when gasoline was free? They live pretty good, thanks to Gaddafi. And what you think about bombing Libia? Did you know that French and USA bombs get to civilan objects? There is a bunch of innocent killed children and womens. And they call it "protecting civilians from tyrany" what a hypocrisy. its clear as glass, they want Libiya, they want power, they want oil, "protecting civilians" its just a mask. I'm on the side of Gaddafi, but i know he got no chances. Of course Russia and China abstained from voting, because it is provocation, they just have to stay away. if they say no, there will be cause for conflict, and thats what USA wants. It easy to understand. Situation is clear. just think about who benefits from it and all becomes clear. One more time, sorry if I offend you, I don't whant it, I just said my point of view and thats all. just use google translate from russian to english. Of course translation will be not perfect, but you will get the point. It is independent sources so there no formal confirmation of that facts. So you can belive it or not. As for me , I just find it good food for thought. I disagree with some parts but some parts is very logic and seems to be true. I hope you will find it intresting. Read and tell me what you think. Hi, Did you get my last comment with links man? @f(illzy): I'm sorry it took me so long to publish your previous comment. For some reason some of your comments are getting flagged by the spam filter, and I forget to check the spam comments tag sometimes. Thank you for providing those links. I consider myself to be an open-minded person. I will read the articles posted on the website whenever I have the time, but I have some school work to take care of at the moment. I was hoping the sources you were going to provide were from a reputable news agency or journalist though, not simply an opinionated post that someone posted a blog. Again though, I will read it with an open-mind, yet with a critical eye. I'll let you know what I thought about it as soon as I have the opportunity to read it. Thank you once again and take care. Although I’m the one who originated this post, I have yet to get involved in the ongoing dialogue unfolding here. It is perhaps because I am of two minds when it comes to this whole Gadhafi scenario. I have to say that the Imperialist military & diplomatic strategy of the U.S. & friends to facilitate regime change in Libya is obviously a ploy based on oil politics, self-interest, Pro-Israel bias & hypocrisy. The entire policy violates an internationally accepted practice of non-intervention in sovereign nation’s affairs. As f(illzy) has rightly noted, Gadhafi has made great strides in improving the lives of the Libyan people. According to U.N. statistics from 1969, when Gadhafi took power, Libya was the world’s poorest nation. They are now the only country in the world that year after year has reduced inflation & unemployment. Gadhafi has spent billions of dollars in oil money building homes, schools, & places of work, shoring up the infrastructure of the country. Libya has the highest literacy rate of any North Africa country. Under Gadhafi’s leadership, water has been discovered beneath the Sahara & is piped or shipped throughout Libya. He has also made constant improvements in agriculture so that the Libyan people have plenty of food. Jobs, food, education, a higher standard of living...he has accomplished all of these. But there always appears to be two Moammar Gadhafis. The above mention champion of his people & the one who so easily opened fire on those same people. The social reformer & the strong-armed totalitarian. There is the Gadhafi who was recruited by CIA Agent Edwin P. Wilson with payment of tons of arms & munitions funneled into Libya in 1977 & the one who closed the American & British military bases & nationalized (at least in part) foreign oil & business interests. There is the Gadhafi whose support of Abu Nidal (a known Mossad operative) helped weaken Arafat’s PLO & the one who is rabidly anti-Israeli. This unchecked dichotomy on the part of Gadhafi has led to the split persona & divided world opinion. My biggest problem with Gadhafi is his use of lethal force against his own people. The resorting to extreme violence to solve social problems lies at the core of the Libyan rebels stance. Although on the surface, it appears that day to day life has improved, at what cost? The loss of individual freedom is now the real issue. Is it better to rule with an iron fist or a velvet glove. & if Gadhafi’s only response to calls for change is imposition of force, then perhaps it is time for that change, at the top. We would obviously be better served at the diplomatic table than on the battlefield. If we believ that force is not the way, then we can not resort to its use. Maybe we should get Minister Farrakhan to sit down with Moammar & see if they can work things out. As always, not a mere flip of the coin, but a roll of the dice, & the die has many sides. I always look forward to seeing your opinion on these matters NO. You always have some very insightful thoughts to contribute. Although I might not agree with every single statement you make, or others for that matter, I enjoy reading other's thoughts which are insightful or persuasive enough to force me to challenge my own beliefs. It seems as if every American who is capable of casting a critical eye on our country, rather than trying to be blindly patriotic, eventually develops conflicting opinions about our country. One one hand, we do enjoy a great deal of freedom in this country. There are many amazing Americans, and plenty of reasons for loving this country. However, I believe that our government leaves much to be desired, regardless of which party happens to be in office, or control Congress. We have repeatedly interfered in the foreign affairs of other countries. Despite the fact that many Americans seem to be clueless as to the extent that our government has been responsible for overthrowing governments or propping up ruthless regimes, the rest of the world obviously is not. If we did not have such a tarnished reputation, we probably wouldn't be receiving so much criticism over our involvement in Libya today. I can understand why the US is interested in handing over the command of UN forces. Any involvement they have in another country, regardless of their actual agenda, is going to be very heavily criticized. Even if their intentions are pure, many will claim that they are only after Libya's oil. I do believe something needs to be done about Gaddafi, just not by the United States. Based on his statements, I do not believe that he is willing to negotiate. The fact that he has stated that he will allow the military to go from home to home in Benghazi in order to "cleanse" those homes of those who do not support him, is a huge cause for concern. Someone who makes such statements does not deserve to be in power, and if they are not willing to step down, then I believe they should be expelled by force. first of all guys, there is no formal proof that Gaddafi use lethal force against his own people. To be honest, its just a lie. He use force against armed solders, who assaults police stations and other objects. Armed and aggresive dangerous rebels, that goes against the official authorities that under the law is a crime. its not a kids and womens. Second, no one country has the right to invade another and violate its sovereignty. Thats what Europe and USA do now. it is agression. And now the most intresting part. In Yemen now a revolution, and thousands innocent people killed by goverment forces. In Bahrein forces attack civilian demostrations with tanks! In Côte d'Ivoire the same situations, innocent victims. And in Siria too. and remember what happened in Georgia couple of years ago? Crazy tyran Saakashvili killed 2 thousand innocent people, and only Russia invade and stoped him. Why UN and USA did nothing? Why they do nothing now with Bahrein, Yemen, Siria, Cot dIvoire? There is a most outrages tyrany conflicts there then in Libia. Why UN Europe and USA dont bombing Bahrein, Yemen, Siria? But they stick exactly to Libia. How you explain this? looking forward to hearing this music! thanks..also interesting to read these comments.This may have been one of the more enlightening comment sections I've stumbled upon lately. Hopefully for everyone's sake the U.S will learn to mind it's own affairs. We need to obviously.